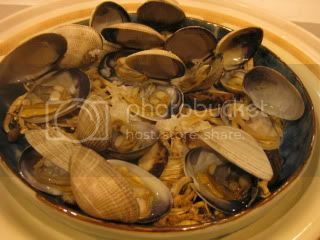 It's a nice season for wild-caught clams right now. So, I made quick "sakamushi" (steamed in sake) style clams & sun-dried mushrooms, with home-fermented shio-koji! For this dish, I use my wonderful donabe steamer, "Mushi Nabe". I just set it at the table, put the ingredients, and the dish is ready right at the table. This dish is ridiculously easy to make and amazingly tasty. 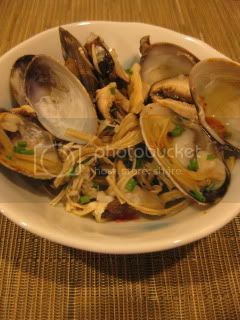 In a shallow bowl (good enough to fit the donabe), put some sun-dried mushrooms (shimeji, enoki, and shiitake) and clams. Add about 2 tablespoons of each sake and water. Also add 1/2 tablespoon of shio-koji. 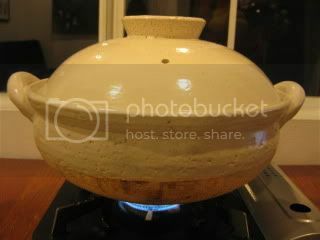 Put the bowl into a steaming Mushi Nabe and steam until everything is cooked through (about 5 minutes). To serve, I sprinkle some minced chives and drizzle la-yu. So tasty.